Ok, I'll make this short at first, I'll explain more later and put up some pics when i get more time. I got the lights all hooked up, and currently have them wired to the (orange) side marker lights. Is this what people describe as flickering? I have not lined in a capacitor yet, is that the issue here? I just need to put a capacitor in line to bandaid the voltage drop? Too bad there are only a couple of us on here that have done it.. I saw your other post about successfully installing them! Looks like you're the 1st brave soul to try this. I hope you get your wiring issue resolved. I have a question about retrofitting it though. Was everything a direct bolt on without any modifications other then the wiring? Did you have to do any physical modification? Have you tried contacting the seller for advice? Do you have a thread showing the installation and how much did the parts cost you? Do you mean to connect the cap in series withe the LED? Actually no, it goes in parallel. not series. I don't have a thread on the full install process, but I will do a write up soon. Any updates on the write up and wiring???? Haha yeah, sorry for slacking on that! It's just been a busy couple weeks for me. is yours 08 a sport model? Very good idea hooking it up to the side marker as that is almost always getting voltage. As far as the parts, what did you need? Obviously the DRLs, but any type of control box or mounting brackets? Last edited by LandSeaAir; 07-29-2011 at 10:27 PM. 6. 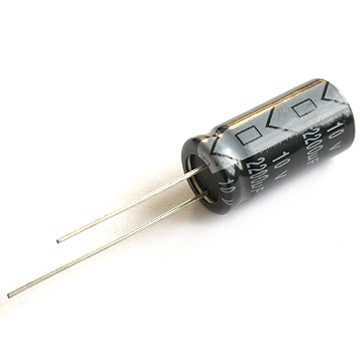 2 Capacitors (50-150 uf @25v) Aluminum,radial lead normal or high temp range will work. You can see in the picture where you necessarily need to cut. Use some common sense when doing this. don't cut into anything that is visible from the front of the car with the plastic mesh piece in place. I recommend using a dremel with a small diameter cut off wheel for this (to get in the tight spots). Step 3.5 - Now you're going to need to install the chrome bezel onto the LED fixture. you will notice that there is a tab that is meant to index into the bumper. Now, it is up to you if you want to chance slitting the bumper in the right spot. I, however just clipped off this tab from the chrome bezel and ground it flush. No problems yet and the light is plenty sturdy without it. a bit like a vestigial tail if you ask me. Step 4. Assemble LED into the backing plastic (may need to scrounge for some hardware) I used some 8mm bolts screwed into a clip nut that was slid over some corresponding holes on the LED fixture. Step 5. Finagle the light/chrome bezel/backing plastic assembly into the newly cleaned out bumper holes (from the rear) (thats what she said), once in place you can sandwich in the front mesh piece and screw it all together. once it is tight you are all done with the light install. You will find that some various screws/mounting hardware are necessary for this. I recommend installing these at someones house that has lots of extra random junk like this lying around. Other than the hardware to bold the LEDs to the backings, you should have enough screws from the OE stuff you are removing. Step 6. Now it is time to wire em up. I created my own plug and it was a mess of hacking up PC pin connectors, soldering stuff, melting plastic together at the right pin width.. I wasted way too much time on this, pay whatever price the dealership wants for these plugs and save yourself the headache. Once you have your OEM plug, put in your capacitor (one per side) in parallel (positive to positive,negative to negative) with the circuit. (note the directional arrows or polarity noted on the Capacitor. If it is backwards you will find out quickly due to it exploding in a 'pop-it' sized firework explosion. (some are non polarized if you feel like being lazy) Make sure it is securely soldered in and then you can plug the wiring into the vehicle side electrical connection of your choice. I chose the side markers since I had already made some connectors and had wires ran out from there. you could just as easily use the fog light connectors, it just depends how you want to activate them. *I have no errors from my fogs being disconnected. Anyway. at this point the lights should work and not flicker. You're ready to install the bumper again. Just line up the index points on the sides near the marker lights and then re-bolt the bumper. 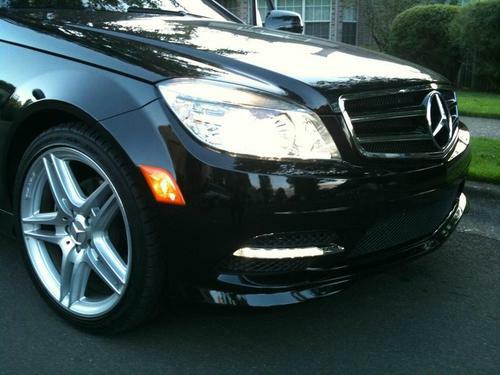 after that you're set and now a certified owner of a 2011 c class . Oh and for extra pro-points get the mirror cover updates which I also have ($139 on ebay). Any questions, feel free to ask. I'll try to get that part number list tomorrow. Wonderful job, you are the first person I've seen on here to do it successfully and explained it quite simply. About the wiring, How many wires are there coming from the actual light? Is it two, a pos and a negative? And instead of making your own connecter or buying one from the dealer, was there something from stopping you from just cutting the connector off and hard wiring it? Also, on the 2011's, when you turn on your headlights the DRLs dim, because yours is hardwired it obviously wouldn't do that, so do you know if yours are always really bright, or are they always dim? there are Two leads coming out of the back of the LED fixture, but they are probably 1/2 inch down a recessed area. I could have hard wired them but my soldering iron is a big big and clunky, I would have surely melted part of the plastic housing. I also told myself that I was going to go back and buy the plugs, but my improved versions have held so far. and yes, just Positive and negative out of the LED. Sorry to keep being a pest, but do you think you could post the part numbers? This is the first mod I am going to do, and I am hopefully getting the car this Thursday!! Heres a cart I have on Parts.com, am I missing anything? Last edited by LandSeaAir; 08-02-2011 at 12:41 AM. Nice write up! Where did you get the capacitor from? Is there a specific type? Do you have a picture of it? Also, what did you do with your foglight wiring since you didn't connect them to it? Is it just dangling? I know you indicated that there's no error message. Haha I know guys, I looked for the packing slip over the weekend but I couldn't find it. I am going to head out and take one more look this morning before I head to work.. I'll keep you posted. Okay guys, here are the part numbers. 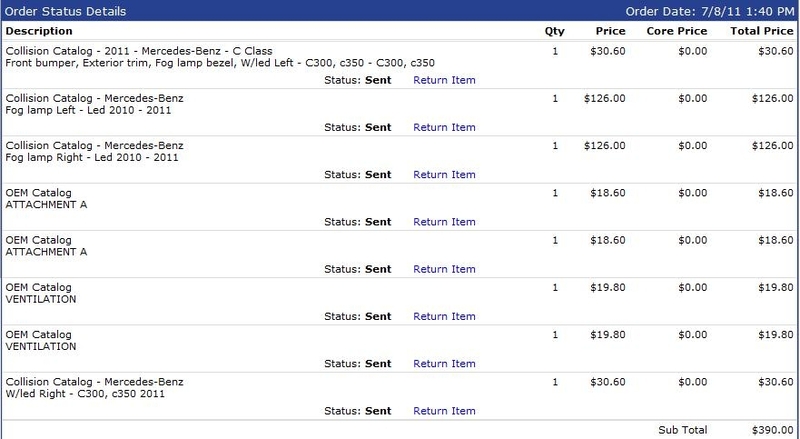 I have attached my parts.com list as I looked some up using their site and others I simply entered part numbers. The description that comes up when you enter the part numbers is much more vague than when you look the part up through their site.